COLLEGE STATION — Hillary and Scott Oswald met in first grade at Pebble Creek Elementary School in College Station and married last December. They have not only overcome obstacles but also excelled while pursuing their undergraduate degrees at Texas A&M University. Doctors diagnosed Hillary with RP while she was in middle school. Her first symptom was night blindness, but hers was not the stereotypical case. Most people who have the inherited disorder also experience tunnel vision. At that time, Hillary still had a normal field of vision. Tests conducted by a leading retina specialist in Boston projected that she would go entirely blind between ages 50 and 60. However, studies are underway that show promise for stopping the progression of RP in pigs and potentially reversing the condition. Currently, with corrective lenses, Hillary’s vision is 20/100, but that is not stopping her from living a fulfilling life by anyone’s standards. In high school, when she could not see the white volleyball under the fluorescent lights in the gymnasium, she began running cross-country and track. That scenario was not perfect either, though. With daylight savings time, the darkness during before-school practices prevented her from running the same cross-country routes as her teammates, so she ran 16 laps around the track instead. Hillary has since run seven half-marathons. She also plays beep ball, a version of baseball for the blind in which all the players, with varying degrees of limited vision, are blindfolded except the pitcher and the catcher, and the ball and the two bases used in the six-inning game make buzzing sounds. She has worked as a babysitter and tutor as well. Hillary’s most challenging years were the transition from middle school to high school, when she was not able to play volleyball, a sport that represented a large part of her identity at the time, and later, the move from high school to college. In high school, she attended pre-AP classes with the same students, so they became familiar with her and her disorder. She did not have a 504 plan for accommodations until her junior year. At Texas A&M, where the classes were much larger and the students unfamiliar, Hillary learned to advocate for herself through disability services. She approached each of her professors with her accommodations letter detailing her needs including extra time and copies of PowerPoint slides. 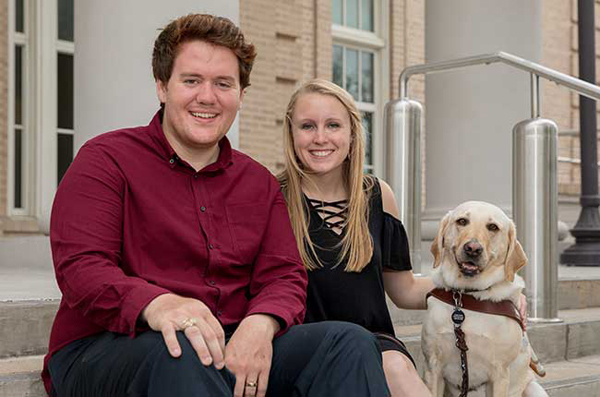 As a freshman, Hillary realized that she needed assistance navigating the vast university campus and decided the time was right to get a guide dog. However, she discovered that she was not eligible for a seeing-eye dog until she was proficient using a cane for the blind. For the next six months, she worked blindfolded with a representative who helped her to cross streets, ride buses and find her way around campus using a cane. After cane training, representatives from Guide Dogs for the Blind in Oregon visited her home, videotaped and studied her gait, and became familiar with her personality. Her sophomore year, she traveled to Oregon where they paired her with Alika, a one-year-old yellow Labrador retriever whom they had already trained as a guide dog. The two bonded instantly and trained together for two weeks during Hillary’s Christmas break. Alika helps Hillary up and down steps and ramps, across streets, over bumpy terrain and around curves to get her to classes and other important destinations. Initially, Hillary thought she might pursue a career in marriage and family counseling, but she decided on teaching instead. Hillary represents the fourth generation of teachers in her family. She plans to return to college in approximately four years to pursue her master’s degree. As a student teacher, Hillary overcame numerous challenges with the help of the other teachers and her principal at Greens Prairie Elementary School where she taught English to third-graders. Among many other initiatives to help her adapt to her job, the school placed bright green tape around the parameter of her classroom to block off a pathway free of students and their gear. The state provided 20/20 pens, which are similar to markers, except that the lines made with the highly visible black ink are easier to read and do not bleed through the paper. Moreover, because Hillary could not see the students raising their hands across the classroom, she called on them to answer questions by drawing Popsicle sticks with their names. Last month, Hillary met the principal of the charter school, International Leadership of Texas in College Station, at a career fair, which led to her being offered a teaching position. Next year, Hillary will teach math and science to fourth-graders. “Helping students understand, seeing their progress, their success, and building those relationships — that they trust you and you trust them — helping them do that is the most rewarding thing about teaching,” Hillary said. While Hillary has met challenges head-on and achieved success in multiple aspects of her life, Scott too has pursued excellence both inside and outside the classroom. 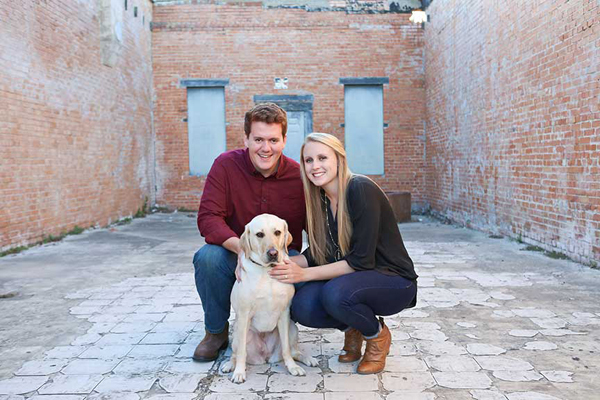 Scott and Hillary Oswald pose for an engagement photo with Alika, Hillary’s guide dog. As a junior in high school, Scott started a foreclosed property preservation company with a friend who attended his church. He and his partner served a 60-mile radius of Bryan-College Station while Scott also attended high school full time. In 2016, Scott transitioned the business into Maroon Mowing. In a short time, the business has grown immensely, and Scott has plans to continue growing the operation after graduation. While taking a full academic load, Scott worked 8 to 12 hours per day in his mowing business. He started Maroon Mowing with 20 properties and added more than 120 in the Bryan-College Station area in just a year and a half. The standard package includes mowing, edging, trimming and blowing off hard surfaces, and extras include cleaning and adding mulch to flowerbeds, trimming shrubs and planting trees and other plants. Scott employs three full-time workers, which allows him to focus on customer satisfaction, while expanding and managing the business. Additional employees, equipment and complementary services to grow the business are part of his big-picture plan for Maroon Mowing. Although Hillary was admitted to Texas A&M one year before Scott, the university office that scheduled the graduation ceremonies gave Scott the upper hand. On graduation day, May 11, Scott will walk away with his diploma 10 hours before Hillary. Scott laughed and retorted that his 3.2 GPA plus his wealth of experience equaled at least a 5.0, much higher than her 3.87. This story published on Texas A&M Today.